I’ve had laundry on my mind. Not because I have to do it, but because I have NOT had any to do! We do have a wonderful ayi who works very hard keeping us in clean clothes, but until this weekend, we had very few clothes to wear. Then our sea shipment arrived. All you expats out there are shouting, “It’s like Christmas!” I’m thinking, “Why do I need this stuff?” I survived just fine on one pair of yoga pants, 3 pairs of shorts, assorted sleeveless tops and sandals. Now I have jeans, sweaters, fleece things, socks, pajamas, more yoga pants, jackets, coats, blouses…and a sparkly teal 80’s formal dress. Don’t judge. Last week I went on a walking tour of the Former French Concession (stay tuned for my “Brief History of Shanghai” post to learn more). We saw lots of laundry hanging out to dry, as is the norm here in China. Every Monday, Wednesday and Friday you can see our clothing on racks outside on our back deck. It never occurred to me that there might be a reason – other than just a cultural thing – for putting it all out there, so to speak. Let me tell you what I learned. Our tour guide told us that the Chinese people believe that the sun disinfects their clothing. They hang it out whenever they can. I wondered if there was any truth to this? This is what I learned. Apparently, when you air dry your clothes in the sun they are naturally disinfected and whitened. Not sterilized, just disinfected. The sun provides UV light, and UV can be used to disinfect water and damp laundry. UV from the sun also interferes with the reproduction cycle of bacteria by damaging their DNA. The Chinese also frequently wash their shoes and put them out to dry. This also makes previously smelly shoes, less smelly. There is a pretty heated (pun intended) debate found here: http://www.thenakedscientists.com/forum/index.php?topic=42169.0 What it comes down to is this: yes, it’s good to air dry your clothes because it can disinfect them. It’s also good to put them in the dryer because that can ALSO disinfect them. The Chinese people have been connected to laundry for a very long time. Every wonder why? Early Chinese immigrants to the United States had a very tough time finding jobs due to their lack of English language skills and plain old racism. As a result, they started turning to laundry work, which was considered low status because it was “women’s work”. Laundry work required long days of exhausting manual labor over kettles of boiling water and hand irons heated on stoves. By the 1870’s, Chinese laundries were operating in all towns with Chinese populations. The case of the Yick Yo laundry really shows the discrimination against the Chinese people in California. In the late 1800’s, the white people of San Francisco lobbied for a law requiring that all laundry businesses be housed in brick buildings, thereby making it impossible for the Chinese laundry owners to afford rebuilding their businesses. Chinese business owners decided to fight back. They argued that the law was inherently discriminatory, and won! They got to stay and run their businesses. The advent of the electric washing machine was the demise of the Chinese laundry. There are still some in the US, I read about one in Brooklyn, NY. Remember the old Calgon ad? Ancient Chinese secret? It must be the air-drying. Shhh…don’t tell. Or on poor AQI days here in China! The Chinese do wash their shoes often, smart. Great post. 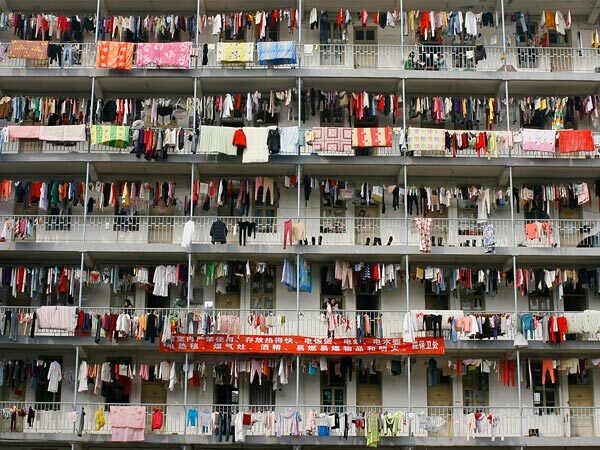 In Taiwan, most people air dry their clothes. There are 110 volt driers, but they’re small and slow. With a family of 7, we had an electrician rig up a 220 outlet and went with an American dryer—bought from a second-hand store—on our balcony. Quite the excitement one day when we had to use the fire extinguisher on the outlet when it went up in flames. Wow. Good times. I’m sure you went out and got yourself another one, right? Actually, only the outlet caught on fire. The dryer lived to dry another day. Emily – I understand completely. I’m not sure if it’s the right thing for my family, but I’m going with it for now. I have more things to worry about! I hope you loved living in Shanghai, it’s a pretty cool place! We just air-dried our beddings last weekend (my Chinese husband suggested we do this for every weekend now, I don’t mind if he carries the beddings to the top floor and hangs them up every single time) – not because they were wet but because sun was out and we have a big problem with mold in Shenzhen (as does everyone else who lives here, I guess). If it doesn’t help, at least it won’t hurt either. I think hanging clothes out to dry is a great thing; I just never had the gumption to try it in the US. Lazy. Like the lower electric bills, too. Not sure how I’ll feel about it come cooler, damp days of winter? Loved reading your thoughts, Meggan! So…about those electric bills. Once you hit a certain level in usage, your bill will double (even triple) so don’t get too used to those lower bills. At the 3 month mark, ours shot sky-high!